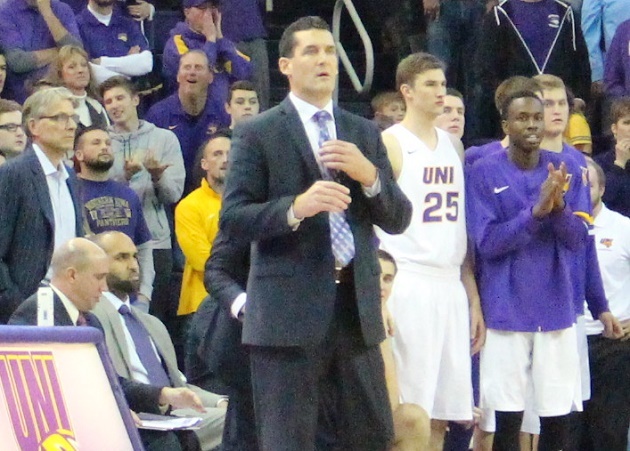 The Northern Iowa Panthers earned head coach Ben Jacobson his 200th career victory with an 83-63 triumph over the University of Dubuque at the McLeod Center in Cedar Falls Wednesday night. Jacobson becomes the ninth Missouri Valley Conference coach to win at least 200 games in the league. 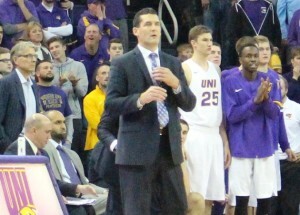 In his 10th season with the Panthers, UNI’s all-time leader in coaching victories now has a career record of 200-106. Playing their first game since Saturday’s upset of top-ranked North Carolina, the Panthers struggled to put their Division-III Iowa Conference opponent away. UNI owned a 38-31 edge at halftime and twice built 12-point leads in the second-half, only to have the Spartans pull to within six each time. The Panthers eventually put the game away with a 23-9 run late in the second half. Wes Washpun scored a game-high 22 points to lead four UNI players in double-figures, while Andre Norris led Dubuque with 20. The victory improves UNI to 3-1, while Dubuque’s record stays at 2-1. The game was an exhibition on the Spartans’ schedule, so the loss doesn’t count against their overall mark.